Rosai–Dorfman disease (RDD) is a rare nonmalignant condition described as a separate clinico-pathological entity by Rosai and Dorfman in 1969. RDD belongs to a group of nonmalignant histiocytic disorders characterized by an increase in the number of histiocytes (mainly mononuclear phagocytic cells and antigen presenting cells) of bone marrow origin in nodal or extranodal sites. Histologically, there is presence of pericapsular fibrosis and dilated sinuses, heavy infiltrated large histiocytes, lymphocytes, and plasma cells in the lymph nodes (LNs). The presence of emperipolesis in histiocytes is considered diagnostic of RDD. In this communication, we report a case of RDD occurring concurrently with peripheral T-cell variant of Non-Hodgkin's lymphoma (NHL) emphasizing its rarity. A 60- year-old female presented with bilateral multiple painless neck swellings and associated fever of four months duration. On examination, multiple swellings of various sizes were palpable at left parotid, neck nodal levels Ia, Ib, II, III, IV, and level V bilaterally [Figure 1]a. The swellings were nontender, firm, and mobile. Multiple LNs were also palpable at bilateral axillary regions along with a right epitrochlear LN. Fine needle aspiration cytology revealed increased prominence of sinuses, histocytic proliferation, and histiocytes containing macrophages (emperipolesis) that mandated immunohistochemistry (IHC) correlation to exclude RDD [Figure 1]b. Subsequent biopsy showed complete effacement of LN architecture by diffuse infiltration of monomorphic atypical lymphoid cells. These cells were having features favoring NHL. The IHC staining revealed positive S100, positive CD68 staining of histiocytes, and absent CD1a features consistent with RDD along with positive leukocyte common antigen, CD3 and negative CD20, epithelial membrane antigen, Tdt and MIC-2, and favoring the diagnosis of a peripheral T cell NHL [Figure 2]. Patient was planned for six cycles of cyclophosphamide, hydroxydaunorubicin (also called doxorubicin), oncovin (vincristine) and prednisone regimen q21 day's cycle (injection cyclophosphamide 900 mg I/V, injection adriamycin 50 mg I/V, injection vincristine 1.6 mg I/V, and tab prednisolone 100 mg po). Patient received six cycles of chemotherapy, and the treatment period was uneventful. Patient is on regular follow-up, and clinically, there is no evidence of disease [Figure 1]c.
Although etiology of RDD is still precarious, infectious (Varicella Zoster, Epstein–Barr virus, Cytomegalovirus, Brucella More Details, Klebsiella), genetic, and inflammatory processes have been postulated in its pathogenesis. There is an increase in the number of histiocytes, mainly mononuclear phagocytic cells and antigen presenting cells of bone marrow origin in nodal or extranodal sites. Microscopically, LN shows presence of pericapsular fibrosis and dilated sinuses, heavily infiltrated with large histiocytes, lymphocytes, and plasma cells. The presence of emperipolesis that stains positive for S100, and CD 68 is considered diagnostic for RDD. Apart from S100 and CD68, IHC stains are positive for CD163, α1-antichymotrypsin, α1-antitrypisn, fascin, and HAM-56 and are typically negative for CD1a. Most commonly, patients present with bilateral massive painless lymphadenopathy with fever, night sweats, and weight loss. The co-occurrence of RDD with lymphoma (Hodgkin's or NHL) has been rarely reported. On extensive search of literature, we found 20 cases of RDD occurring concomitantly with lymphoma (Hodgkin's or NHL). In majority of the cases, RDD precedes malignant lymphoma, and in very few cases, RDD occurs synchronously with NHL. The clinical course of RDD is unpredictable; it can remain indolent for years and sometimes regresses spontaneously. Rarely does it manifest any systemic symptoms or organ dysfunction, usually sparing the bone marrow, spleen, and liver. There is controversy over the treatment protocol and usually “wait and watch” approach is acceptable for most patients. The available treatment options include steroid therapy, surgery, or single agent cytotoxic therapy. While diagnosing RDD, clinicians should maintain a high suspicion for the presence of occult lymphoma. We recommend a holistic approach in patients diagnosed with RDD to exclude the presence of occult lymphoma. Henter JI, Tondini C, Pritchard J. Histiocyte disorders. Crit Rev Oncol Hematol 2004;50:157-74. Juskevicius R, Finlay JL. Rosai-Dorfman: Disease of the parotid gland, cytologic and histopathologic findings with immunohistochemical correlation. Arch Pathol Lab Med 2001;125:1348-50. Levine PH, Jahan N, Murari P, Manak M, Jaffe ES. Detection of human herpesvirus 6 in tissues involved by sinus histiocytosis with massive lymphadenopathy (Rosai- Dorfman Disease). J Infect Dis 1992;166:291-5. Melikyan AL, Kovrigina AM, Gilyazitdinova EA, Gitis MK. 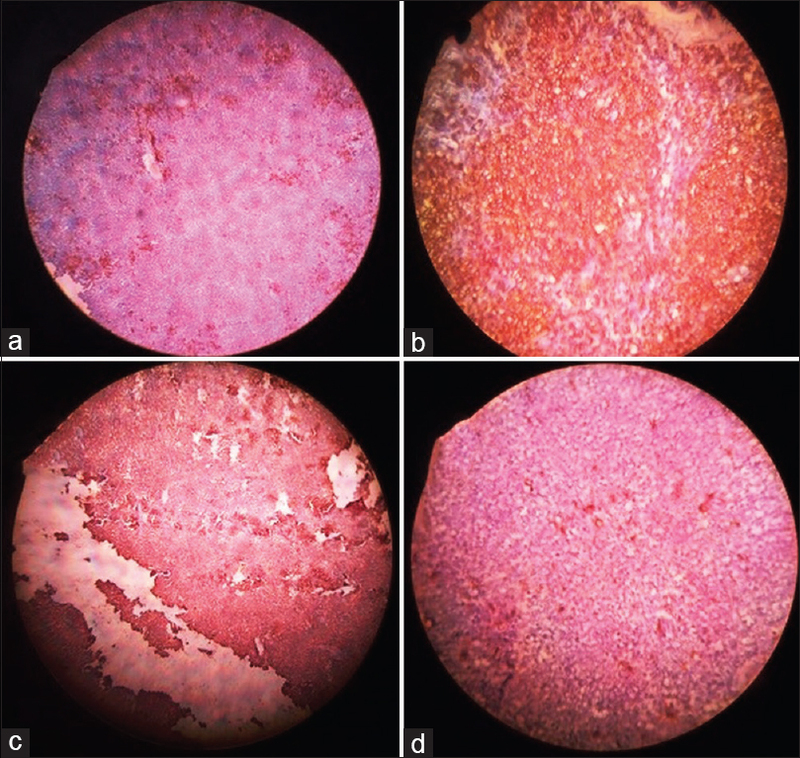 A case of sinus histiocytosis with massive lymphadenopathy (Rosai-Dorfman disease) in a patient with diffuse large B-cell lymphoma and chronic hepatitis B virus infection. Ter Arkh 2012;84:66-70. Moore JC, Zhao X, Nelson EL. Concomitant: Sinus histiocytosis with massive lymphadenopathy (Rosai-Dorfman Disease) and diffuse large B-cell lymphoma: A case report. J Med Case Rep 2008;2:70. Oka M, Kamo T, Goto N, Nagano T, Hirayama Y, Nibu K, et al. Successful treatment of Rosai-Dorfman disease with low-dose oral corticosteroid. J Dermatol 2009;36:237-40.